A company of U.S. soldiers in camp at Chickamauga, Ga., stand with their commander in an albumen print about the time of the Spanish-American War. Capsule summaries of seven volumes include Masters of the Shoals by Jim McNeil, Sacrifice at Vicksburg: Letters from the Front by Susan T. Puck, Blue & Gray at Sea edited by Brian M. Thomsen, The Defense of Vicksburg: A Louisiana Chronicle by Allan C. Richards Jr. and Mary Margaret Higginbotham Richard, Rebel Reefers: The Organization and Midshipmen of the Confederate States Naval Academy by James Lee Conrad, “For Fatigue Purposes…” The Army Sack Coat of 1857-1872 by Patrick Brown and These Honored Dead: How the Story of Gettysburg Shaped American Memory by Thomas A. Desjardin. A brief summary of the Battle of Chickamauga is illustrated by nine images, including Brig. Gen. John H. King and two other officers mounted on their horses, Capt. William W. Helm of the Confederate 3rd Kentucky Cavalry, Pvt. James Thomas of the 57th Indiana Infantry, an unidentified private from the 15th Pennsylvania Cavalry, Corp. Melvin A. Hurd of the 74th Indiana Infantry, 1st Sgt. Henry Fritz of the Confederate 2nd Kentucky Cavalry, Col. Newell Gleason of the 87th Indiana Infantry and a portrait of an unidentified soldier taken by photographers Schwing & Rudd, Army of the Cumberland. 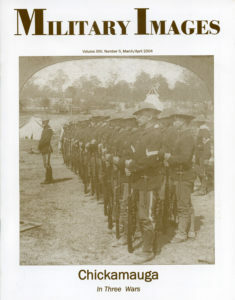 A profile of Camp Thomas in Chickamauga, Ga., which was established in 1898 as a training facility for troops during the Spanish American War. About 69,161 volunteers and over 7,283 regulars were eventually housed there. Two stereoview images illustrate the text. Fort Oglethorpe, establish in 1904, brought a flood of troops to Chickamauga, which was National Military Park land. The camp operated until 1947. Images of camp buildings are featured, all photographed by army Surg. Philip A. Sheaff, who is also pictured. The author notes that, “The stylish, distinctive and comfortable New York State issue jacket was popular with the troops. It was even worn by troops from at least one other state.” A total of 10 images are featured, and one is identified—Pvt. George Aker of the 44th New York Infantry. 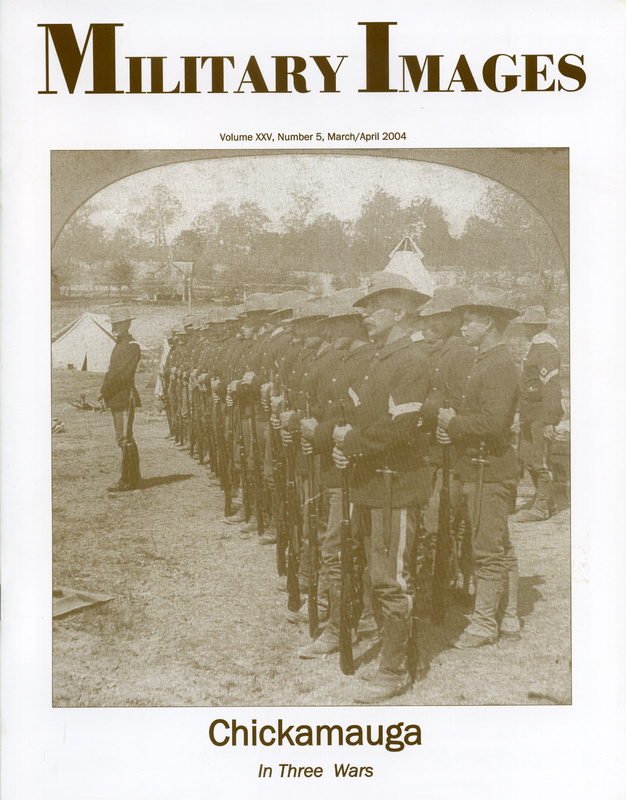 Mini-biographies of Maj. Baxter Smith, Campbell Craig and Pvt. E.M. Brown are presented along with portrait photos of each soldier. Eight unidentified portraits of men who served in Company G of the regiment are featured. According to the author, the “old collector” from whom he purchased the images said that the individual from whom he bought them personally took them off the wall of a Grand Army of the Republic Hall in Hershey, Pa. The author documents brutal crimes committed by members of the 14th Rhode Island Heavy Artillery (Colored). The story is illustrated with portraits of two of the regiment’s officers, Maj. Joseph J. Comstock Jr. and Capt. Joshua M. Addeman. Five portraits of men who served in the famed “California Hundred” of the 2nd Massachusetts Infantry pose with a elaborately patterned drape. A sixth man from the 44th Massachusetts Infantry also poses with the drape. The name of the photographer is a mystery. Four of the men from the 2nd are identified: Capt. Charles S. Eigenbrodt, 1st Sgt. Robert H. Williams, Pvt. Jacob Walther and Pct. Joseph H. Burke. The soldier who served in the 44th is Pvt. Isaac Carry. Mounted Cavalry did not play a major role in the campaigns of the Spanish-American War, but stereo photographers found images of them great sellers to the public. A survey of 8 stereoviews is included from the collections of Ron Da Silva and Philip Katcher. August John Krohn, a sailor who served on the Wilmington, died of typhoid fever in 1901. His remains were buried in the English Cemetery. Despite photographic evidence of his grave, the site has disappeared and its whereabouts remain a mystery. Four privates in the 21st Pennsylvania Cavalry, George Schriver, George W. Scott, Jonathan H. Bosserman and D.C. Brinkerhoff, are pictured here. The regiment is known for exchanging gunfire with Confederates outside Gettysburg, Pa., on June 26, 1863, and for serving as the bodyguard for President Abraham Lincoln when he visited Gettysburg to participate in dedication ceremonies for the national cemetery. The authors, following the pioneer work of William Frassanito at Gettysburg, have uncovered the spot where several 1862 images were taken of the battlefield. The study is illustrated by period and contemporary images of the Henry Hill area, where heavy fighting occurred during the First Battle of Bull Run. Burgess, a museum specialist at Manassas National Battlefield Park, asserts that the well-known George Barnard photograph of the William N. Thornton house is in fact the home of John Thornberry. In “The Orange Blossoms,” McAfee examines the uniforms of the 124th New York Infantry. Better known as “The Orange Blossoms,” the regiment received this name from its commanding colonel, the colorful Augustus Van Horne Ellis. Portraits of Bugler Moses Ross and Sgt. Woodward T. Ogden are featured. Two images are featured: A little girl holding a portrait of a soldier that is very likely her father, and Pvt. Thomas J. Presson of the 1st North Carolina Cavalry. A soldier dressed in the uniform of an officer is identified as Pvt. William Jefferson Billings, who served in Companies E, G and H of the 25th Georgia Infantry. The confusion of the uniform rank and actual rank is not explained.